I spent a long time sitting in front of my computer and thinking about how to start this post. Do I write the incredible soft crumb texture of this Instant Pot Cornbread first? Do I talk about the ingredients that I used to make the Cornbread moist without adding too much oil? Do I mention pumpkin and yogurt and eggs? Should I start with the inspiration for the Instant Pot Cornbread or how to eat it or details about the ease of making it? How about describing this cornbread? It’s soft and savoury. Slightly spicy and a little bit sweet. It’s delicious warm and cold. It keeps well on the counter for a few days and doesn’t get dry. It’s not crumbly and perfect to be sliced. Or do I simply start with a statement? Statement that is contrary to what most people think about cooking in Instant Pot and specifically baking in an electric pressure cooking. You can bake right in the instant pot without any extra inserts, baking forms, or water! How’s that for the start? How to bake right in Instant Pot insert without water? Yes, it’s possible! All you need is a special ceramic insert for your Instant Pot. That’s it! It’s that easy! You can line the ceramic insert with parchment paper for easy cleanup. Or, like I do in this Instant Pot Cornbread recipe, oil and dust the insert with some cornmeal or flour. You need to use LOW pressure, not the default high pressure. Your Instant Pot most likely will NOT come to pressure while baking in it without water. This is expected! What can you bake in Instant Pot besides cornbread? I have baked quite a few different things right in my Instant Pot without any water and any forms. Bread – regular bread was my first try. I didn’t follow a good recipe, so it turned out a bit doughy in the centre but the edges were very good and crispy. 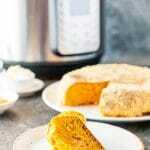 Instant Pot Pumpkin Cinnamon Rolls – I have made these in the oven and in my Instant Pot. In the electric pressure cooker they were a bit softer but less puffy. Russian Cheesecake – I am trying to update this original recipe but I feel that I might just go back to what works and update the instructions to work for Instant Pot as it bakes beautifully in it. Instant Pot Brownies – I made these a few times directly in my Instant Pot in the ceramic liner and they turned out really well and super easy! And, of course, this Instant Pot Cornbread – I made it many times with the same result. Important: what model of Instant Pot can “bake” without water? I have only tried baking like this with my model. My model is Instant Pot DUO Plus 60, 6 Qt 9-in-1. I don’t know if it will work with other models. However, I am a member of a facebook group where many people “bake” like that in a ceramic insert. That’s where I learned that trick. And from what I understand, they all have different models. Do you really need Instant Pot Ceramic Insert to bake Instant Pot Cornbread? Yes and no. I have tried using regular metal insert to bake once. It worked. But it wasn’t as good as with the ceramic insert. I have not tested making this Instant Pot Cornbread recipe with the regular metal insert though. So, I would very highly recommend getting one. It’s also great for making rice. 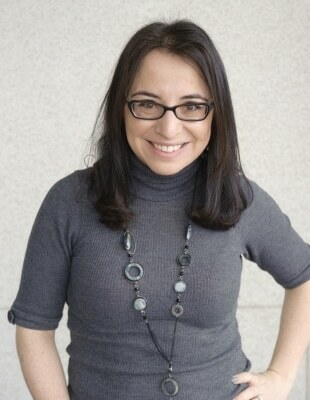 Remember, this technique is not what Instant Pot electric pressure cooker was designed to do. It is basically a hack to use it this way. It means that it may very well not work for your particular model. I have used this technique about a dozen times without any issues but my model of Instant Pot does not ever give me a burn notice. If your model is prone to showing a burn notice, then this technique may not work. 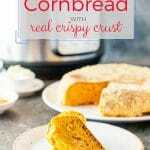 Why use Instant Pot to bake cornbread? You don’t have to preheat the oven, so it actually saves you a step, a little bit of time, and the kitchen doesn’t get hot. If you are making a big dinner then you can use your oven for something else while cornbread is “baking” in the electric pressure cooker. My favourite is the time: you DON’T have to be home to turn off the oven and take the cornbread out!! If your cornbread is done making in Instant Pot and you aren’t home, it is going to be totally fine! I have left mine in Instant Pot for an hour or even more after it was done baking and it was still perfect and really warm. 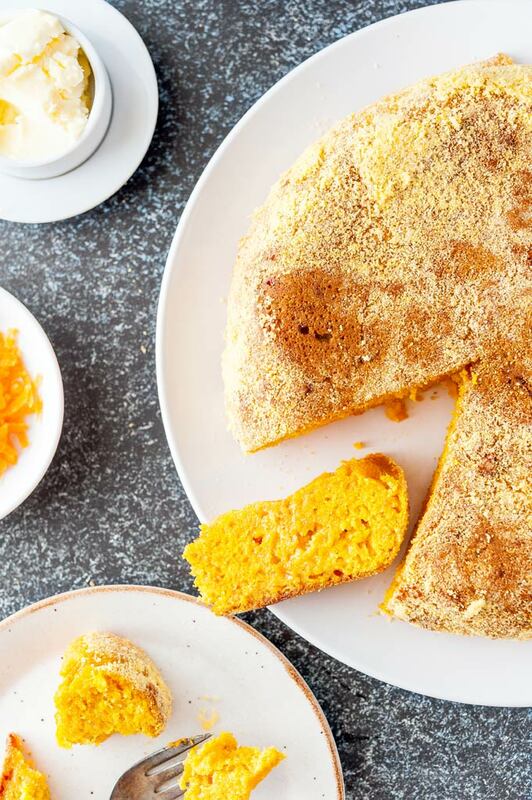 NOTE: You don’t have to use Instant Pot to bake this cornbread. I personally haven’t tried it with this particular recipe but I’m about 99% sure that it will turn out just as delicious in the oven. Just bake at 375F for about 40-45 minutes in a 8×8-inch baking dish. 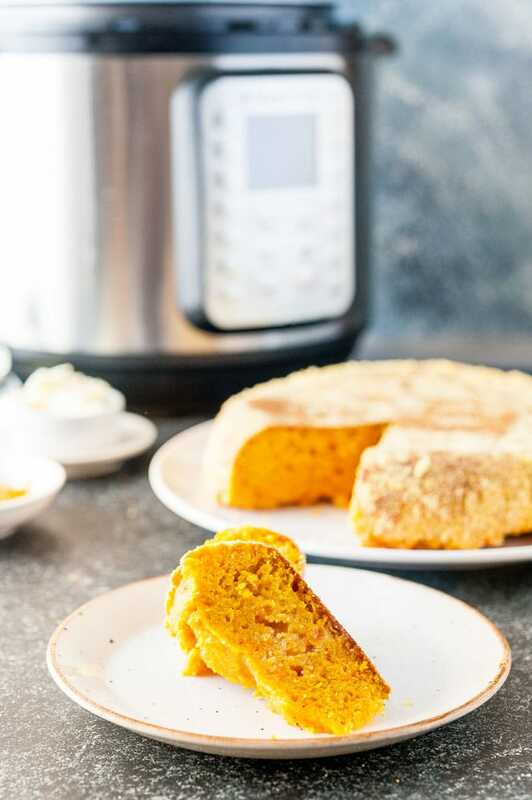 This Instant Pot Cornbread recipe is a true one-bowl recipe. 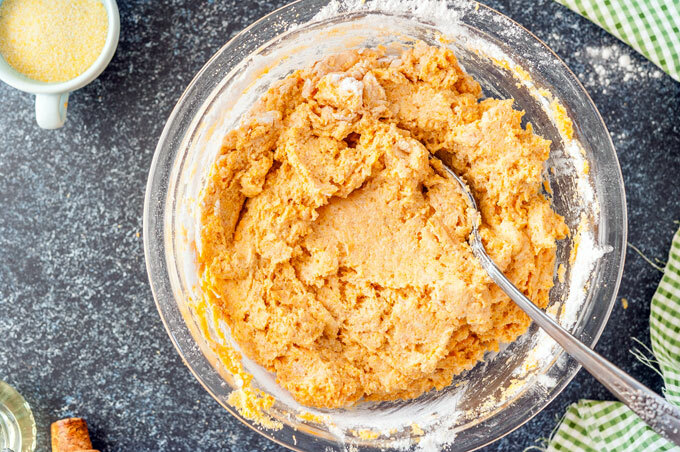 All you do is whisk the wet ingredients really well, then add the dry ingredients and mix just until combined. Transfer to the prepared Instant Pot ceramic insert and “bake” for 45 minutes. 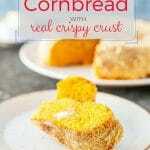 It really doesn’t taste like pumpkin but it adds moisture thus making the cornbread soft without extra oil. Use thin yogurt, around 1-3% fat. If you are using thick yogurt like 6-10% fat or Greek yogurt, then you might need to use a bit less and add milk to thin it a little bit. Alternatively, use Buttermilk or Kefir. I made this cornbread with Kefir and it tasted great also. 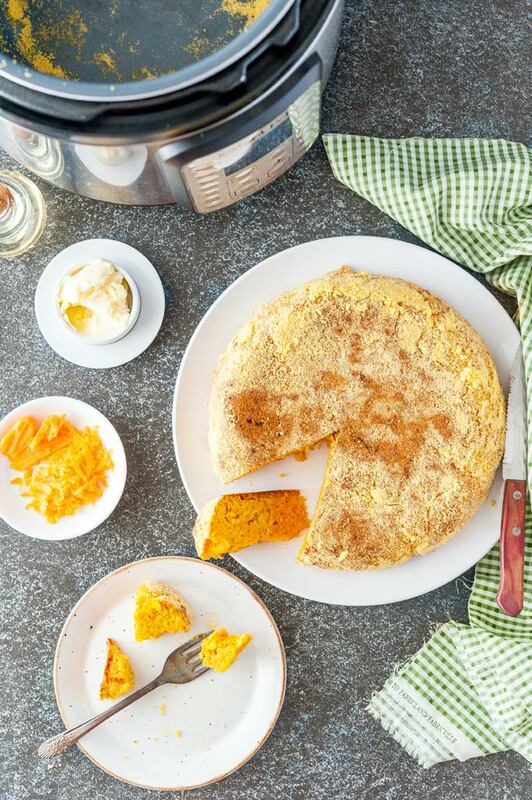 This Instant Pot Cornbread Recipe is quite neutral. Paprika is mostly added to play up the colour of the pumpkin and make the cornbread beautifully orange. Cayenne is added for just a hint of spice. Feel free to add more or omit. I love adding sugar to highlight the savoury flavour of ingredients but it can be omitted. Feel free to add more salt if you like saltier foods. I think cumin would be great in this cornbread also. Just experiment and add your favourite spices. Jalapeño – I love adding jalapeño to my cornbread so, you could add half or a whole finely diced pepper to yours if you like spicy. Corn – I am not a big fan of corn kernels in my cornbread but I’ve made it with the corn as well, you can add about 1 cup drained corn. 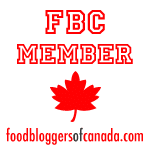 Feta – I haven’t tried adding feta but I am sure it would taste great. 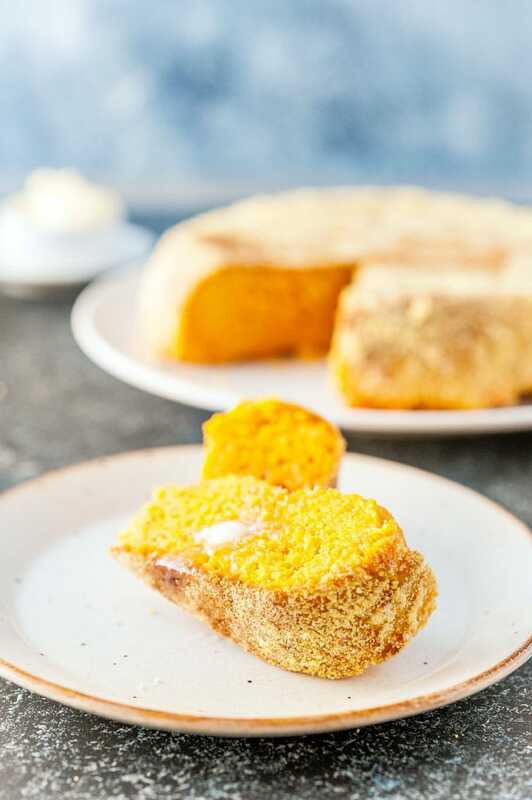 Pan-fry a few thin slices of this Instant Pot Cornbread and serve with a poached egg. The cornbread tastes amazing with runny egg yolk. Make a simple hash with small cubes of cornbread: sauté a bit of onion, sweet pepper, bacon, and cubes of cornbread. Serve with a sunny side up egg. Add a few slices of this cornbread to a cheese platter with strong cheeses like pungent blue cheese or salty feta. Smoked Oyster Stuffing from Sarah of Champagne Tastes. She’s using white bread in the recipe but mentions in comments that it’s great with cornbread also. 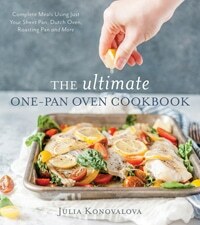 If you love cornbread and would like a different version without pumpkin, then you need to purchase my book, The Ultimate One-Pan Oven Cookbook, I have a delicious recipe for Applesauce Cornbread there. 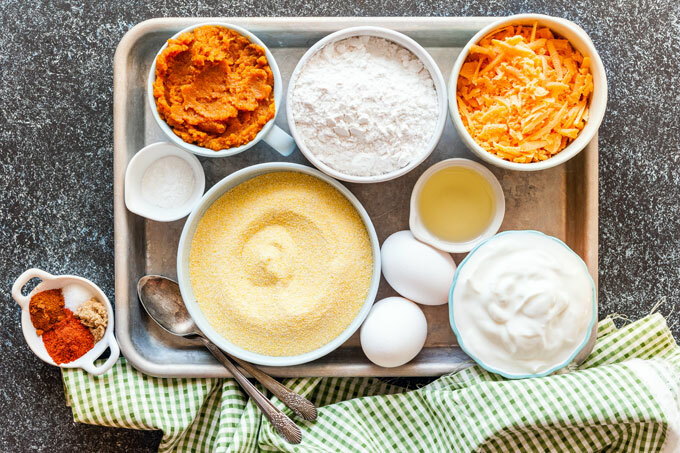 In a large bowl, whisk together the pumpkin purée, yogurt, eggs, and oil until smooth. Add the cheese and all the spices. Mix. Add the cornmeal and mix. Add the flour and baking powder and mix just until incorporated. Do not over mix. It's ok if the mixture is lumpy. Brush the Instant Pot ceramic insert with oil at the bottom and a bit on the sides. Add a little bit of cornmeal to the pot and shake to make sure that the bottom and a bit of the sides are covered. It will prevent the cornbread from sticking to the pot. Evenly spread the cornbread batter inside the ceramic insert of Instant Pot. Cover the pot with a lid. It does not matter if the valve is turned to sealing or not as the pot will not get pressurized anyway. Make sure to choose LOW pressure for Instant Pot. Set the time to 45 minutes. It'll take about 5 minutes for Instant Pot to heat up and then it'll start cooking and the countdown will start. Once Instant Pot beeps that the cooking of 45 minutes is done, open the lid. Carefully slide the knife around the edges of the Cornbread to loosen them and then invert the pot onto a plate. Can you use the stainless steel pot that came with the IP? Thank you so much! It worked exactly as you said it would!! 3. pour directly into ceramic insert. do not add any water! 4. Set controls for low pressure at 45 minutes, pressure button did not pop up. 5. You may want to experiment with less time as it came out really crispy (as I like it). 6. Turn onto plate and enjoy. Easiest and best corn bread around. then use Jiffy Corn bread mix instead of muffin mix. very, very easy! I am really glad it worked! You can use your favourite cornbread recipe or mix with this technique! Did exactly as you said and it turned out exactly as you said. Thanks!!! Thank you so much! I am really glad it worked well!